The biocybernetic loop is the underlying mechanic behind physiological interactive systems. It describes how physiological information is to be collected from a user, analysed and subsequently translated into a response at the system interface. The most common manifestation of the biocybernetic loop can be seen in traditional biofeedback therapies, whereby the physiological signal is represented as a reflective numeric or graphic (i.e. representation changes in real-time to the signal). In the 90’s a team at NASA published a paper that introduced a new take on the traditional biocybernetic loop format, that of biocybernetic adaptation, whereby physiological information is used to adapt the system the user is interacting with and not merely reflect it. 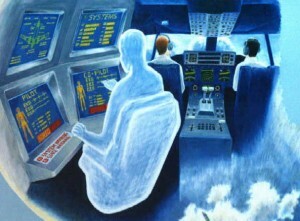 In this instance the team had implemented a pilot simulator that used measures of EEG to control the auto-pilot status with the intent to regulate pilot attentiveness. Dr. Alan Pope was the lead author on this paper, and has worked extensively in the field of biocybernetic systems for several decades; outside the academic community he’s probably best known for his work on biofeedback gaming therapies. To our good fortune we met Alan at a workshop we ran last year at CHI (a video of his talk can be found here) and he kindly allowed us the opportunity to delve further into his work with an interview. So follow us across the threshold if you will and prepare to learn more about the origins of the biocybernetic loop and its use at NASA along with its future in research and industry. This entry was posted in Research and tagged biocybernetic adaptation, biocybernetic loop, biofeedback, biofeedback games, interviews, NASA on May 20, 2012 by Kiel Gilleade. In our final workshop video Alan Pope presents “Movemental”: Integrating Movement and the Mental Game (PDF). 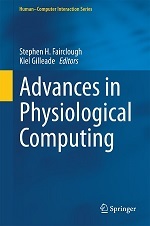 For the uninitiated Alan Pope co-authored a paper back in the early 90’s which introduced the concept of bio-cybernetic adaptation which has become a key work for us in the field of Physiological Computing. It was with much excitement that we received a paper submission from Alan and it was great to have him talk shop at the event. Alan’s latest work with his colleague Chad Stephens described several new methods of adapting controller interfaces using physiology, in this case a Wii game controller. I was going to release the original footage I recorded during the workshop, however the camera failed to pick up any of the game demo’s that were shown. As one of my particular research fancies are biofeedback based game mechanics (e.g. lie-detection, sword fighting) I’ve remade the video with Alan’s permission using his power point presentation and so the demo’s can be enjoyed in all their glory. A videogame or simulation may be physiologicallymodulated to enhance engagement by challenging the user to achieve a target physiological state. A method and several implementations for accomplishing this are described. So that’s the end of our workshop video series. I hope you’ve all enjoyed them, for now I’m going to hibernate for a month to recover from the editing process. This entry was posted in News and tagged bbiCHI2011, biofeedback, NASA, videogames, Wii on July 15, 2011 by Kiel Gilleade. This week see’s the release of the talks presented during the Evaluating the User Experience session. To view these talks and more please click here. For guidance about the session 3 talks please consult the abstracts listed below. This entry was posted in News and tagged affective games, bbiCHI2011, biofeedback, psychophysiological evaluation, storyboards, user evaluation, ux on June 17, 2011 by Kiel Gilleade. This entry was posted in News and tagged adaptive responses, BCI, biofeedback, biofeedback games, concepts, phobia on March 21, 2011 by Steve Fairclough. This entry was posted in Experimental, Musings and tagged affective computing, anger, anger management, biofeedback, physiological computing, stress management on January 26, 2011 by Steve Fairclough. This entry was posted in Musings and tagged affective computing, biofeedback, body blogs, concepts, neurofeedback, pervasive computing, telemedicine on November 4, 2010 by Steve Fairclough. Well that was a disappointment. In the end Nintendo decided against demonstrating the Wii Vitality at this year’s E3. A representative of the company stated that the Vitality was a no-show because Nintendo did not believe the event was a suitable environment for the product. Disappointing but given their press event was jam packed with a number of AAA games and a new portable it was understandable. However with the Vitality aimed for a late 2010 release it doesn’t give Nintendo much time to create a buzz around a product that frankly has none. In actuality I was surprised that Nintendo didn’t use their recent endorsement deal with the American Heart Association to hype Vitality pre E3. While the product is currently being marketed towards mental health (i.e. stress management), rather than physical health which the AHA endorsement concerns, Nintendo could of easily used the event as part of a broader health platform and so make better use of the publicity the endorsement deal attracted. This entry was posted in Musings and tagged biofeedback, biofeedback games, breathing, Innergy, Ubisoft, videogames, Wii Vitality on June 29, 2010 by Kiel Gilleade. This entry was posted in Musings, News and tagged biofeedback, concepts on June 1, 2010 by Steve Fairclough.